A Matter of Memories: :SALE: 12% OFF all Easter-themed products...TODAY ONLY! 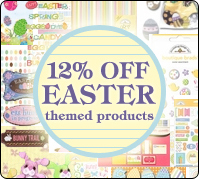 :SALE: 12% OFF all Easter-themed products...TODAY ONLY! If you've got a little time to do some shopping inbetween your holiday festivities today, it would be a great time to stock up on Easter-themed items! TODAY ONLY, Scrapbook.com is offering 12% OFF the regular or sale price on ALL Easter-themed products! No coupon code is required. The discount will be applied to all eligible items at checkout and will appear at the bottom of your cart. Hurry - this offer expires soon!